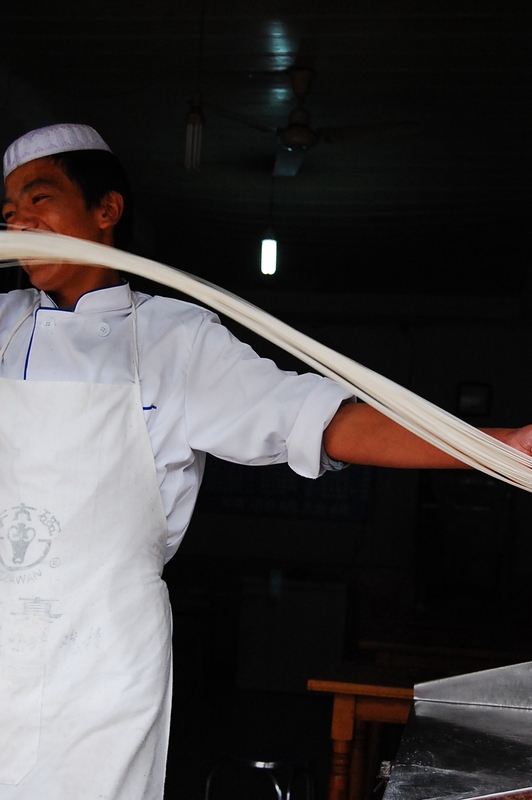 Lamian dough – heftier to work than it looks. La-mian (literally translated into English as ‘Pulled Noodles’) are a truly visual eating experience – fresh wheat dough pulled by hand into long, even strands, served in a plain beef broth. Perhaps this doesn’t sound all that special, but it must be seen to be believed, and in China, La-mian are usually made within eyesight of the diners. 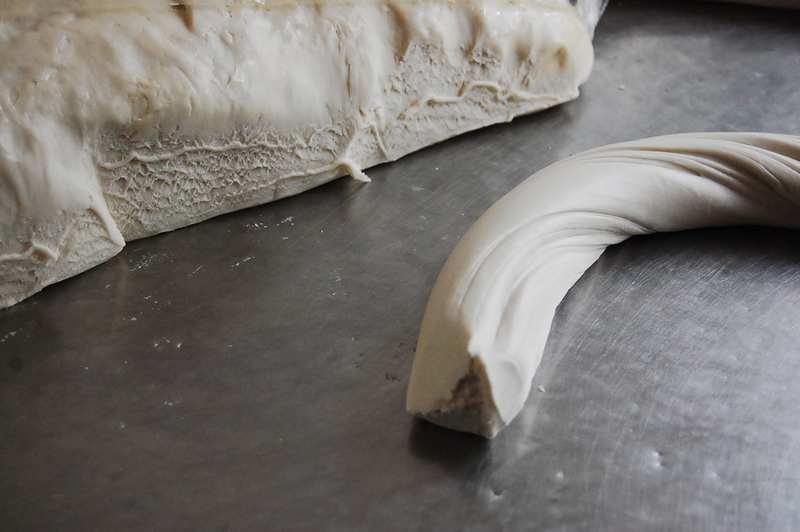 Through a magical and mind-boggling process of twisting, folding, pulling and loud slapping of the dough onto the work-board, the chef creates perfect noodles from raw dough in mere minutes. He or she also makes it look ridiculously easy, which it certainly is not. La-mian comes from the city of Lanzhou, the capital of Gansu Province, in China’s north west region. Lanzhou is on the borderlands of Han China, meaning that it’s population is a lot more ethnically diverse than in the major cities on the east coast. 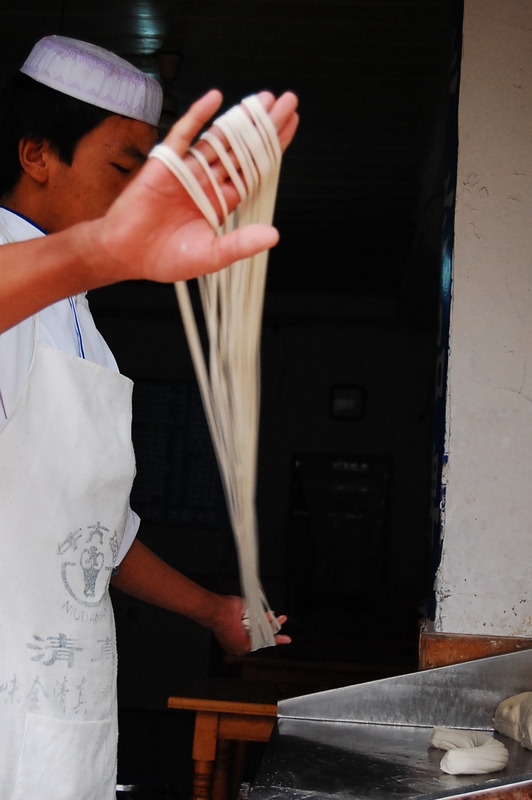 One of the largest ethnic groups here is the Hui Muslim minority, and it is most often Hui chefs who one can find making La-mian across China. La-mian restaurants in China are usually pretty basic affairs, but are often open later than many other eating places, making them particularly convenient for a midnight snack. They’re also amongst the few restaurants in China where pork is not on the menu – Hui Muslims keep halal, and choice of meat at La-mian joints is usually only beef, chicken or lamb. La-mian itself is a cheap, filling and delicious meal. The finished dish itself isn’t that much of a looker – just plain white noodles in a clear soup, topped with sliced cooked beef and fresh coriander. 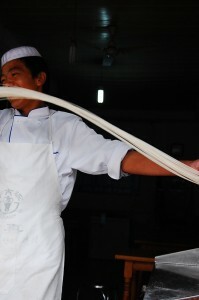 But it’s the visual spectacle of the making of the noodles, right in front of you, which makes La-mian so special. Check out Jessie’s blog recounting her adventures around the world at http://jessielevene.com/.